Slay is a simple to learn game of strategy and cunning set in medieval times. 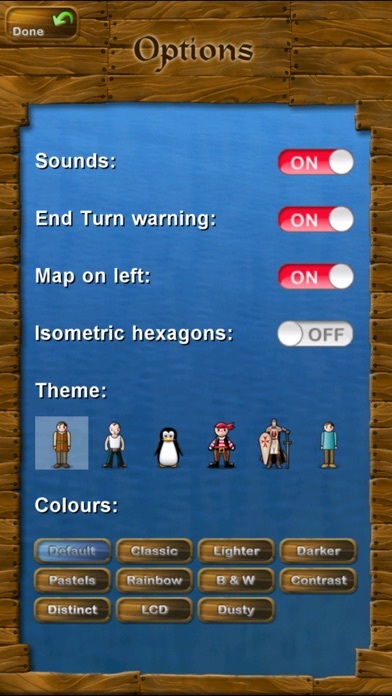 The island is divided up between the six players, and you must try to capture your enemies' land and link up your own territories to create larger and stronger ones. 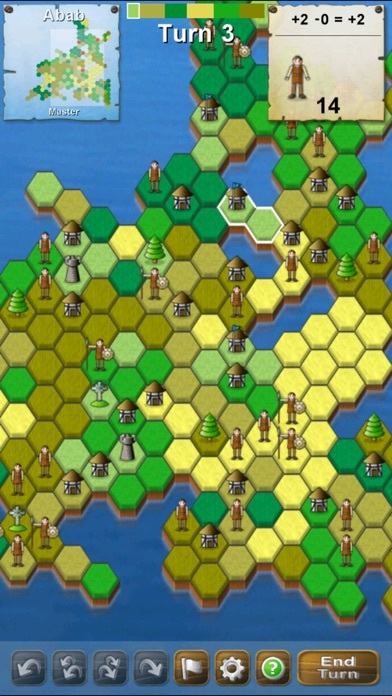 You begin capturing land by attacking with your peasants. 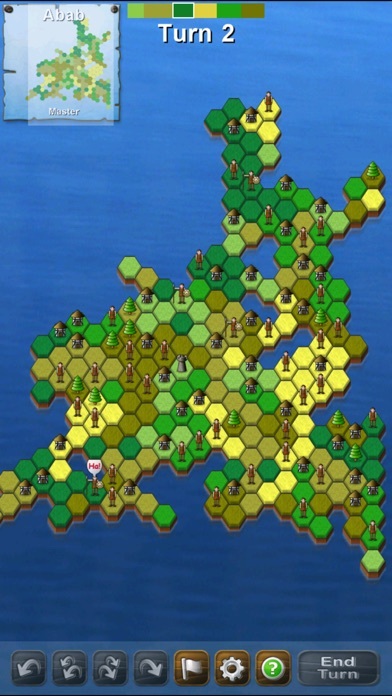 Once your territories become richer you can combine peasants to make stronger and stronger people (Spearmen, Knights and then Barons) who can kill weaker enemy troops, or knock down their castles. Just be careful that you don't create too many expensive men or the territory will go bankrupt! "This game is pure strategy! It's a work of genius. Brilliant AI. Engaging turn-based multiplayer strategy. Sid Meier, eat your heart out!" - GameSpy.com "I love this game! I play it all the time, and when I'm not, I think about wanting to play it." - PocketNow.com "At first glance, Slay looks elementary, but hidden beneath are cunning strategy elements that must be finely balanced for success" - PC Magazine "Deceptively delightful. The graphics are simple, but the strategy is complex." - Download.com For the latest news on all my games follow @SeansGames on Twitter! I've been playing the game for about 5 years (I played the lite version for the first 1.5 because I hate spending money), & I'm becoming increasingly frustrated with this purchase. There aren't bugs so much as things that bug me after having purchased the game. I really enjoy playing the game (download Slay Lite first if you haven't played it before), but even after the recent update there are so many small quirks & flaws to the paid version I can only give it 1 stars ⭐️⭐️. Here's why: 1. The game itself hasn't been modified or updated for 20 YEARS & the price is $4.99. I'm not complaining about that so much except for I'd rather have about $3.99 of that back for what I got. 2. There are lots of levels, but then the creator goes & makes "additional levels" available for an additional fee. When I purchased the game I thought I was getting all of the levels, including the ones shaped like certain nouns (people, places, things or ideas). These additional levels cost a whopping $0.99/26 or a "discounted" $10 for all 18 pages. 3. As far as I know, the in-app purchase doesn't act like the "complete my album" option in iTunes , so, even if you wanted to buy 1 page of 26 maps, you couldn't do so without having to consider paying $10 now versus $18 later. It's like trying to scam the people who really like the game because so few do play and like it but when they do he needs every single penny to survive financially (note: this is not how to win fans of the game) 4. People who purchase the app should be able to make & store their own custom levels. Again, especially for the price, this needs to happen. I'd pay $4.99 to be able to make custom levels. 5. Online turn-based games need to happen. It would put the game in the category of others like Words With Friends where you can move at your own pace but still get good, genuine competition instead of only a local pass & play as it is now. This is different from local play & is wayyy out of date even tho local play was an upgrade it isn’t what really needs to happen. 6. The interface / GUI could use a major update as well. Variants still make me think I'm playing a Win95 PC game that this was originally developed for. 6. Even the pass & play is wonky. "Multiplayer" doesn't used the same starting map as solo but it's not the same for 2, 3, 4, 5, or 6 players- from what I can tell the maps are all different with different numbers of players on each map. 7. Allow custom color schemes for any level & be able to store up to 10 of them. Currently I'm stuck with no great options and because I'm color-deficient I choose a them (rainbow) that gives me a bold color (red). 8. The most recent update ‘added’ custom levels- here are the problems with them: -the levels don’t save your place as you’re playing them so when you exit the game you lose all progress -you can’t rename the custom levels (of course it would need to be different from an existing one so that check would need to be added too) -the custom levels currently only allow you to create a land mass & not capitals (player base start locations). 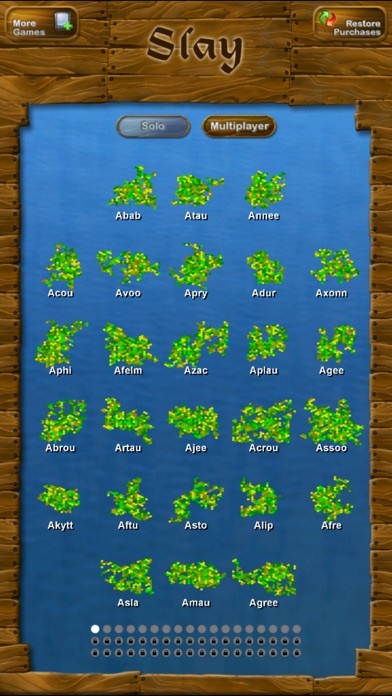 If the creator of Slay insists on making the levels ‘even’ then there should be some formula check for a level when you create a capital or at least specify more than the land mass I'm sure there are more but hopefully this gives any potential buyers some insight into whether or not this game with all left these quirks are worth buying (at the moment I would say I still wish I had my money back) & also gives the developer knowledge of what needs to change about the app. Hey, I want to thank you for adding the local play, I can finally play against my friends. I have a few suggestions. 1. If you can make it iPhone X compatible. 2. Improve the design of the game and make it more Fantasy and a little Modern. Thanks really all and I hope to see this improve. The game will never die if one persons enjoys it and spreads it. Seriously thank you for the last update! Being able to build my own map is fun and absolutely amazing. I’ve been playing slay for a long time and back when I could play it on PC, and now that it’s been in the App Store I’ve been playing it for years. I beaten Almost every level multiple times in different difficulties. Now to be able to build my own maps and play them is fantastic. Games come and go in my life but slay gets played almost daily. If I were to add if you could add much much much bigger levels, ones that are 3-6 times bigger than the ones that are available. It’s just something I’d personally like to try out. Or if there was a feature so I can do that myself. Thank you again for this fantastic game! Simple area control with unit promotion. The ai is challenging enough to keep the many many levels fresh. Really enjoying working through the levels. Thanks for keeping this old favorite going! A great game. Endless maps. An all time favorite just got updated. My absolute favorite game, tons of replay value. This is the one game i've kept coming back to, challenging and fun. Please, please add in a fresh batch of new maps sometime soon! I’ve already beaten all of the current ones several times, and the game has gotten a little stale without new content. I have to give it 5 stars. I've been playing for years. I love this game. And the new look is fantastic. But why, after all this time, is there not an option to turn off surrenders? There is nothing more frustrating than clicking in the wrong place and seeing your game end. I like to crush them. Annihilate them! I'd love an option to turn surrendering off completely. Give it a trial run. Or just save yourself the time and buy it now. A very addictive game.